Welcome back to Part 2 of our food addiction series (you can find Part 1 here, if you missed it). Part 2 is all about dependence: can food in general or certain foods in particular cause a physical dependence that results in withdrawal reactions when you stop eating the food? Can they cause dependence in other ways, even without physical withdrawal reactions? What about food reward? For all of this, bear in mind that dependence is not the same thing as addiction: addiction implies maladaptive behaviors centered on the substance. You can have a chemical dependence on something without any problem behaviors (coffee, for example), and you can have problem behaviors around something with no chemical dependence (e.g. gambling). But since dependence and addiction are very closely related, it’s worth taking a look at both. There’s a very fine line between a food and a drug – in fact, it’s questionable whether you can even draw a line at all. Several different kinds of foods contain chemical compounds that could potentially cause chemical dependence (with withdrawal symptoms when they’re discontinued). One easy example is caffeine. Even without getting into caffeine-fortified foods and drinks, chocolate, coffee, tea, and several other whole foods contain caffeine, a stimulant that can cause chemical dependence. Any coffee-lover who’s tried to quit can testify that the physical withdrawal symptoms are very real: they typically include headaches and fatigue. A more controversial topic is opioid peptides found in wheat and dairy. 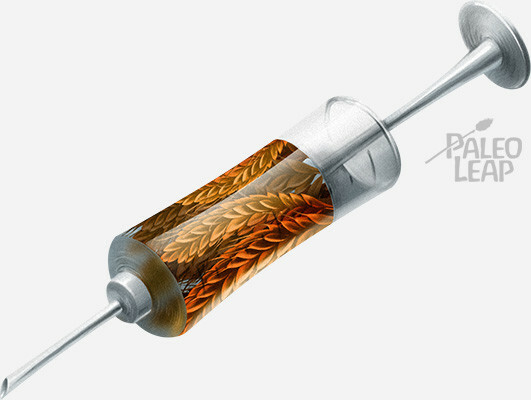 Wheat (specifically wheat gluten) does contain opioid peptides, which bond to opioid receptors in the brain just like the opiates in drugs like morphine and heroin. Dairy also contains casomorphin, another opioid peptide. Considering that opioid drugs cause chemical dependence, this suggests that wheat and dairy could also cause something similar. But that doesn’t necessarily mean that these foods can’t be addictive. Many drugs of abuse (cocaine, for example) have no notable withdrawal symptoms. But nobody would argue that it’s impossible to be addicted to cocaine, just because it has no significant physical withdrawal symptoms. That’s where psychological dependence comes in. In psychological dependence, use of the drug is necessary to a person’s emotional health. Instead of physical withdrawal symptoms like headaches and shakes, withdrawal causes psychological ones like depression or anxiety. Someone physically dependent on coffee would drink it to avoid getting withdrawal headaches; someone psychologically dependent on coffee would drink it to avoid feeling depressed or angry. Psychological dependence is every bit as powerful as chemical dependence. Just to take one example, one study found that about 30% of people addicted to cigarette smoking actually had no signs of physiological dependence on nicotine, but they were psychologically dependent on the cigarettes’ mood-improving effects. A better-researched question that touches on elements of both physical and psychological dependence is the issue of brain chemistry and the possibility for certain super-pleasurable foods to have neurological effects that mimic drugs of abuse, regardless of whether they cause physical withdrawal symptoms like headaches or shaking. Some behavior or substance delivers a super-rewarding stimulus to your brain, something well beyond the “normal” range of rewards that your brain is wired to handle properly. After experiencing the super-rewarding stimulus, physical changes in your brain make you less sensitive to the normal stimulus or ordinary rewards. You now need the extreme reward to feel the same level of pleasure that you used to get from an ordinary reward. Changes can also affect learning, memory, decision-making, judgement, and other aspects of brain function. Taking away the super-rewarding stimulus now causes psychological “withdrawal,” including anxiety, depression, anhedonia (lack of pleasure), insomnia, and other psychological symptoms – but those symptoms have a physical base. Similar neurological adaptations can come from non-drug stimuli – and one of them is food. When it comes to foods, the super-rewarding stimulus comes from foods that are engineered to hit all of our reward centers in a way not found in nature. We’re naturally hardwired to like certain tastes (salty, sweet, umami), textures (crunchy, creamy), and nutrients (sugar and fat). You can read all about this in Michael Moss’ book Salt, Sugar, Fat if you’re curious, but essentially it involves crafting the perfect blend of flavor, texture, and nutrient value to get that super-rewarding effect (think: Oreo cookies, Hawaiian pizza, ice cream with waffle cone pieces…you can easily identify fat, sugar, salt, crunchy/crispy, and creamy textures in all of them). Multiple studies have shown that hyper-rewarding foods can cause the same kind of changes in brain chemistry as drugs of abuse. This has been studied quite a lot in rats: in sugar binges, for example. There’s even some evidence in humans (and here’s some more, as a free full-text) in case you’re tired of reading about rodents getting fat on Oreos and cheesecake. But to make a long story short: yes, foods that are highly processed to be extremely palatable do seem capable of inducing the same kind of physical-psychological dependence as addictive drugs. Withdrawal symptoms fit the pattern of psychological dependence (lack of pleasure/”nothing else tastes good”/real food tastes “bland” or “boring”, anxiety, depression…) but they’re based in physical changes in brain chemistry. In short: yes, there is a biological basis for physical and psychological dependence on food, with most of the evidence revolving around the potential for very highly palatable foods to hijack the brain’s reward system in the same way as drugs of abuse. This doesn’t necessarily mean that eating these foods will cause addiction: for an addiction to be present, the person has to show some kind of compulsive or maladaptive behavior. In Part 3, we’ll explore the relationship between dependence and addiction: do people show behavioral addiction to food? Considering that some people “use” dependence-inducing foods without ever becoming addicted to them, can we really say that processed food causes addiction? What’s the difference between people who show addictive behavior and people who don’t?